Now that is funny stuff right there... What set is that Fritz? Like can you expand the shot? I don't recognize all the tree base and things. I've thought of buying that old wheel house playset to dirty up for a WW2 diorama and when I saw Series 2 Pirates figures there is some great fodder on the way... That's fantastic stuff though. Jesse, what figure are going to be in the second wave of POTC figures? Please let me know and direct me to any websites with pics! sorry not sure how to post pics, but it's on animaenews.net under the sdcc pics. the scoopdogs look like the figs that can go inside are 3.75. be intresting to have a stormie/clone battlesuit. here's a couple extra links. aren't they like $200 though? THat's some pretty expensive fodder, lol. Make sure you visit, Good to go Customs. Your one stop shop for 1:18th custom needs! It says they are 1:12 on the tags there so unfortunately they are going to be a bit too big. Those do look damn spiffy though... Nice stuff. For the record, the Series 2 Zizzle POTC2 figures were found at retail by HunterofthePegs (from our forums here) so they're out there... Some better fodder is in this wave so keep your eyes opened on your toy hunts. Also I'm hearing Power Team Elite is showing up at Big Lots including their bunkbed/locker sets which are awesome. If you're in the vicinity of one it's maybe a good time to look. I'm gonna try to check a couple tomorrow. Does anyone know of any cheap figures out there with diving equipment and/or flame thrower accessories? Also any fodder out there that has long tubes on them? Mainly looking for something with decent length of tube (ribbed...yes I know it sounds bad) to mold/cast for custom pilot figures. I was hoping The Corp figures had something that matched, but not having much luck. Try the Chap Mei figs from big lots. I picked up a few Combat Divers there. I also found a Larger scale Space figure there with lots of rubber ribbed tubeing, perfect for TIE pilot customs. Hmmm now to actually get to a Big Lots... hopefully this weekend. TONS of Power Team Elite figures... They had figure 4-packs, 2-packs with gear/accessories, mid-sized vehicles (littlebird, dune buggy, etc. ), and other items. They, best of all, had an assload of the bunk sets which never had been out at retail. They're awesome. Straxus, there was also Navy SEAL Diver sets, the best figure set of PTE, for $4... There's a breathing pack in that. Tons of great stuff though... 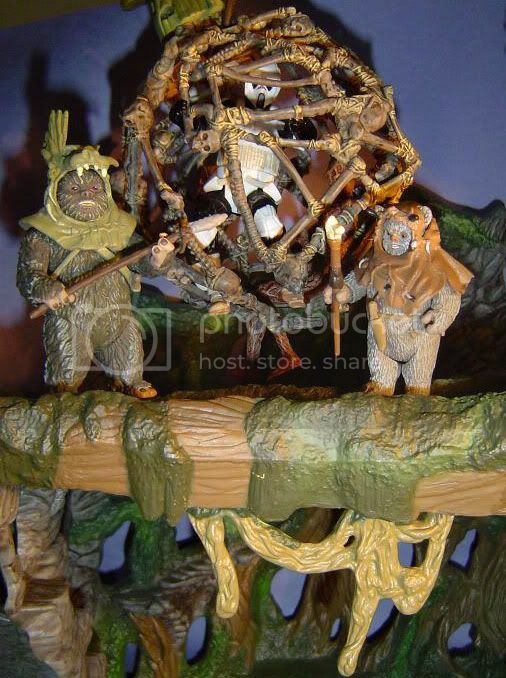 I hope some of the bigger sets show though like the old headquarters playset, the Tank, the Blackhawk, and also this awesome bridge playset that really looks like it has potential. Great items overall. I love these bunk sets though, they're great dio set pieces if you want 'em. Check it out guys if you've got a local Big Lots. Mine turned out to be a goldmine tonight. the figures are decent base fodder too... I'll probably be selling some of mine if anyone's interested (for cheap of course). This may not be exactly fodder, but have y'all seen the $5 sized Ben-10 figures? The four armed guy & little grey guy would fit right into any SW scene. There are other figures that may work also, depending on your taste. There's also a dog type of creature that would make a good beast.